This is indeed a very small part, for the fire raged through a crowded 20 acre lumber storage and manufacturing area. Imagine “lurid” flames covering everything between the river on the north and Fourth and Fifth Avenues on the south extending between 28th Street on the east all the way west to the Sylvan Slough railroad bridge. 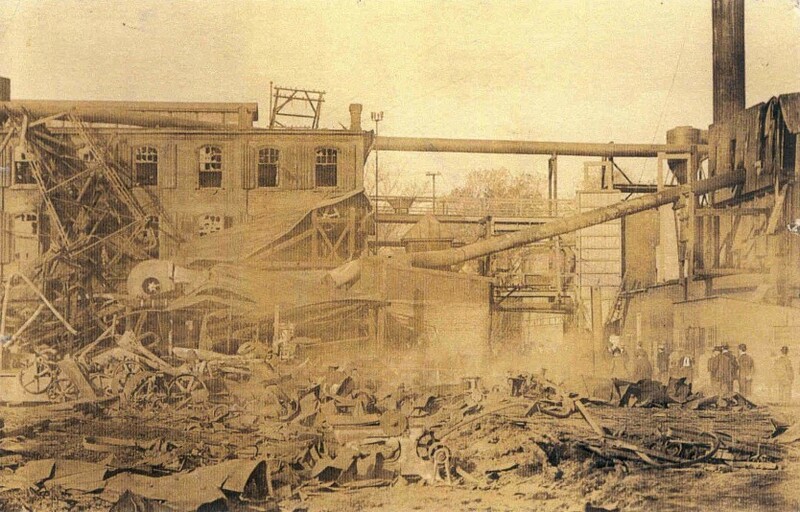 It started about 7:15 pm on the evening of October 15, 1908, when airborne coal dust in a Rock Island Lumber & Manufacturing Company shed exploded. From the shed, located east of 26th Street near 5th Avenue, the fire was driven by a “gale” from the southeast and quickly spread in a wedge shape toward the river. The glowing sky was visible in Clinton and Geneseo as eight million board feet of lumber went up in smoke. One board foot is equivalent to lumber 12 inches square by 1 inch thick. The site’s primary occupants were the lumber company and Rock Island Sash and Door Works, although there were a few homes east of 25th Street and south of Fourth Avenue. The lumber company, with its huge lumber storage sheds, fronted on Fifth Avenue just catty-corner from Sacred Heart Church. Behind it and stretching to the west were the many buildings of the Sash and Door Works. These buildings were used for kiln drying, planing, woodworking, and glazing as well as warehousing and shipping. Several contained specialized machinery, valued at over $100,000, used for manufacturing “millwork of every kind, hardwood veneer doors, softwood pine and cypress doors, frames, windows, stairwork, moulding, columns, etc.” Evidence of the machinery can be seen in the numerous pulley wheels of various sizes scattered in the debris on our postcard. In addition to two spurs running directly into the factory area, there were also tracks of the Rock Island and Burlington lines near the edge of the river in the line of fire. Although box cars were quickly moved out of danger farther up the tracks, the tracks and ties as well as the adjoining railroad bridge to the Arsenal island were damaged, stopping rail traffic for several days. Telephone and telegraph lines were brought down and power lines fell. Hunks of burning wood were carried across the river to Davenport where a firebrand two feet long reportedly landed two blocks north of Locust Street. Flaming coals even started a fire, which was promptly extinguished, at Davenport’s Gordon-Van Tine lumberyard. Firemen from Rock Island, Moline and Davenport responded as did many citizens, including an estimated fifty thousand watchers. Water lines were run from as far away as 29th Street to carry enough water to create a small lake four inches deep over the railroad yards. At the scene, observers included “ladies in fancy ball costumes” mingling with “coatless hatless” men. One lady even came in her bathrobe and curlers, almost unimaginable in that era. They weren’t just gawkers. Groups of volunteers walked along the riverfront, pushing stacks of lumber into the slough waters as they went. Although the lumber had to be retrieved later, the effort ultimately saved thousands of board feet. Despite the near record damage, only three people were injured, but as many as 500 were put out of work. Even with the estimated $400,000 of insurance, the economic implications of unemployment were shattering to the city. But only a day later, with some coal fires still burning but controlled, the Argus reported that the Sash and Door Works would again be in operation in a week. Fortunately a great deal of their equipment was found to be undamaged and their $500,000 loss was mostly in lumber and stock. The lumber company sustained $45,000 damage, while the railroad loss, including the damage to the bridge, was only $5500. The site today holds no sign of the fire or of the massive wood manufacturing operations that took place here. The Quad Cities Botanical Center has replaced a huge three-story woodworking and planing plant, very likely the area shown on our postcard. Lumber sheds were farther east, where the QC Expo Center now stands. Other manufacturing facilities and offices replace lumber sheds on Fourth and Fifth Avenues. Another memorial to this area of Rock Island history remains in many of the Quad Cities’ vintage homes, which proudly display doors, windows, staircases and other ornate, high quality, millwork that was made right here. This article, by Diane Oestreich, is slightly modified from the original, which appeared in the Rock Island Argus and Moline Dispatch on December 4, 2005.